Newlyweds unwind and get ready to enhance your honeymoon experience, through this delightful and luxurious combined itinerary of Sri Lanka and the Maldives. Discover the enigmatic culturally significant teardrop island of Sri Lanka. Spend 8 days exploring the cultural highlights: visit the renowned Golden Cave Temple in Dambulla, explore the Cultural Triangle on mountain bikes, observe the wildlife through a safari in Minneriya National Park, get acquainted with the friendly Sri Lankans, etc… Indulge your last days into the exotic vibes of the Maldives. You’ll be staying at the 4-star Centara Ras Fushi Resort, where you are allowed with a top-notch diving center, Thai-themed spa to relax your senses… Have a beautiful trip!!! Arrival at Colombo airport where you will be met by a representative of our local agency and taken to the hotel in Habarana. Rest and free time for lunch. Around 3 p.m., you will drive to Dambulla, your first Sri Lankan gem. The cave-temple complex has five painted and decorated caves displaying amazing craftsmanship that are a testament to the devotion of Buddhist worshippers. Night at the 4-star Chaaya Village in a Deluxe room (or similar). 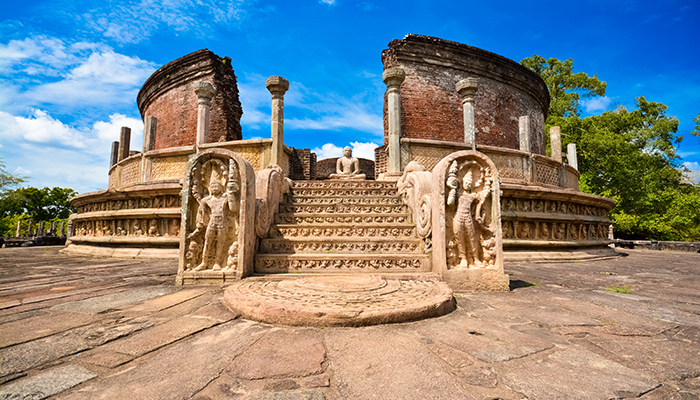 After breakfast you will carry on with your discovery of the renowned Sri Lankan Cultural Triangle by visiting Polonnaruwa, former capital of the Sinhalese kingdom. The site is extensive so you will visit it on mountain bikes, at your own pace. There is much to see: the remains of the city, of course, and also the rice paddies and the lakes. Late afternoon you will go wildlife watching on safari in Minneriya National Park: keep your eyes peeled! After breakfast you will head for renowned Lion Rock in Sigiriya. At the top you can visit the ruined fortified palace and enjoy the stunning views over the valley. You will then learn the art of making the hand-dyed fabrics called batiks. Time for a refreshing boat trip on a typical canoe (“oruwa”) on the nearby lake. Once you 're back on dry land, make the most of your hotel and enjoy the pool: you can take it easy after these last few days of touring! After breakfast you will drive to Kandy and see small villages on the way. You will have the opportunity to stop and visit Matale's spice garden, to learn all about the uses of cinnamon, ginger and vanilla among other spices. Once in Kandy, the last capital of the kingdom, you will visit the famous Buddha Tooth Relic Temple. This entrancing relic was kept by kings in former times, which is why the temple is situated so close to the royal palaces. In the evening you can watch a traditional dance and music performance in costumes and attend the impressive evening ceremony at the Temple of the Tooth. Dinner and night at the 4-star Randholee Hotel (or similar). 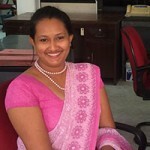 ♥ Honeymoon Extra: You will enjoy a sari-fitting session offered by a specialised shop in Kandy. Ladies will receive a free sari and gentlemen will also get a gift. ♥ Honeymoon extra: Free Ayurvedic massage at the hotel. You will head after breakfast for the renowned elephant orphanage in Pinnawala (2 h 30 min driving time). These elephants get taken in after being displaced due to deforestation or abandoned by their mother. You can admire these animals in their natural habitat and watch them having a bath in the river. You will then drive to Peradeniya to visit the magnificent Royal Botanic Gardens, the largest of their kind in Asia. These Botanic Gardens are filled with amazing trees and gorgeous exotic flowers. You'll be impressed by the diversity of this 60-hectare former royal park. Don't miss the wonderful avenue of palms, the orchid collection and the giant Java fig tree, highlights of this beacon of floral diversity in Sri Lanka. After breakfast you will drive to Nuwara Eliya. The road progressively reaches higher grounds and soon you can see the first “tea gardens”. Various stops are planned on the way so that you can stroll through different tea plantations and visit a factory, where you will learn about the different processes used to manufacture tea. 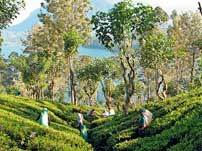 This informative presentation of Ceylon tea will conclude with the offer of a tasting session. 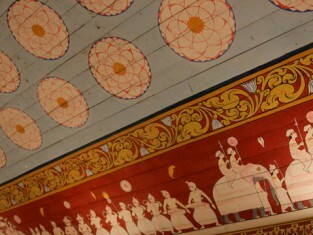 You can then walk around Nuwara Eliya and enjoy the colonial architecture. It will be obvious to you that the town was the favourite residence of English colonists: nicknamed “Little England”, it has kept many typical English features such as the typically British phone boxes, and tea is always served at 5 p.m.! Dinner and night at the 3-star Jetwing St. Andrew's Hotel (or similar). In the morning you will leave the hotel in a tuk-tuk and head for Nanu Oya train station. A new travelling experience awaits when you board a local train! You will meander through the tea-covered hills and see many waterfalls... Upon arrival at Hatton station, a driver will be expecting you. You will then drive to Colombo, an essential city in Sri Lanka. You will take a guided city walk in order to admire and gain a better understanding of the striking contrast between authenticity and modernity. Dinner and night at the 5-star Casa Colombo Hotel (or similar). After breakfast you will go to Colombo airport and fly to Malé in the Maldives. Once in Malé, transfer to your hotel is by boat. Dinner and night at the 4-star Centara Ras Fushi Resort. 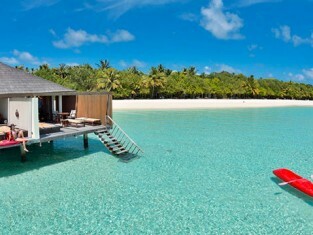 You will spend three nights in the Maldives on an all-inclusive deal, in a beachside villa facing the ocean. You can relax after touring in Sri Lanka and make the most of the gorgeous white-sand beaches and turquoise waters of the Maldives. On Day 11, enjoy this paradise for a little bit longer before flying back home. 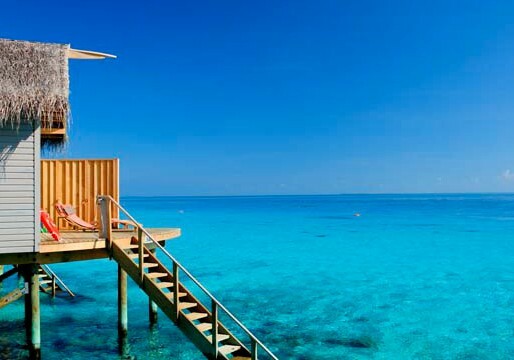 3 nights at the Centara Ras Fushi 4 stars Hotel (Beach front villa, All Inclusive basis).